- his girlfriend has "man-hands"
- his girlfriend is a "sentence-finisher"
Not surprisingly, Jerry never seems to be able to settle down and find the right woman. In the only instance where he finds a girl with whom he thinks he can spend the rest of his life, he breaks up with her because she is "too much like him!" If we follow Jerry's example of always looking for the better deal, we are likely to end up alone. On the other hand, if we fail to cut the ties of a caustic relationship, we might become wed to misery. The school of Shamai argues for a literal interpretation of the text, and teaches that a man can only divorce his wife on account of an adulterous matter. The school of Hillel, on the other hand, offers a more creative and interpretive reading of the text. Hillel plays on the seemingly superfluous word in the Torah "matter (דָּבָר)." He argues that the text is ambiguous so as to indicate that a man can divorce his wife either on account of adultery (עֶרְוַה), or simply because of any matter at all (דָּבָר). Hillel goes as far as saying that a man can divorce his wife for "burning or over-salting the food that she cooks for him (אפילו הקדיחה תבשילו)!" Seinfeld would appear to be a disciple of Hillel in regard to permissible reasons for ending relationships. The discussion in the Gemara ends by relating a parallel teaching intended to shape this whole debate. Rav Yochanan teaches that "שנאוי המשלח, the one who sends away his wife without a compelling reason is despised by God!" This opinion appears as somewhat of a middle ground between Shamai and Hillel. There will be reasons other than adulterous matters (ערוות דבר) that marriages should end, but the grounds for divorce should not be frivolous (like a wife who burns her husbands cooking). While Hillel and Shamai refer specifically to cases of matrimonial divorce, we might consider this lesson as a model for all romantic relationships. When we commit ourselves to another person, we invest our trust, our emotions, and our physical selves. Such a covenant leaves both parties emotionally and spiritually vulnerable. 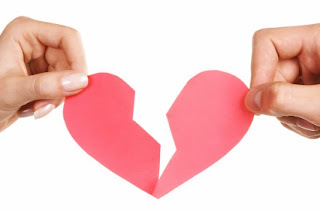 When we find it necessary to break up with our partners, let us not forget to do so with a heightened sensitivity to the feelings of our significant others. Rav Elezar teaches us at the end of this section that"כל מגרש אשתו רשונה אפילו מזבח מורד עליו דמעות, when a man divorces his wife, he causes the Temple altar to be covered in God's tears." The spark of God exists within every friendship and relationship. When we dissolve the bonds that tie two people together, we extinguish that spark. In endingrelationships, we should do so with compassion, and not out of spite and levity.